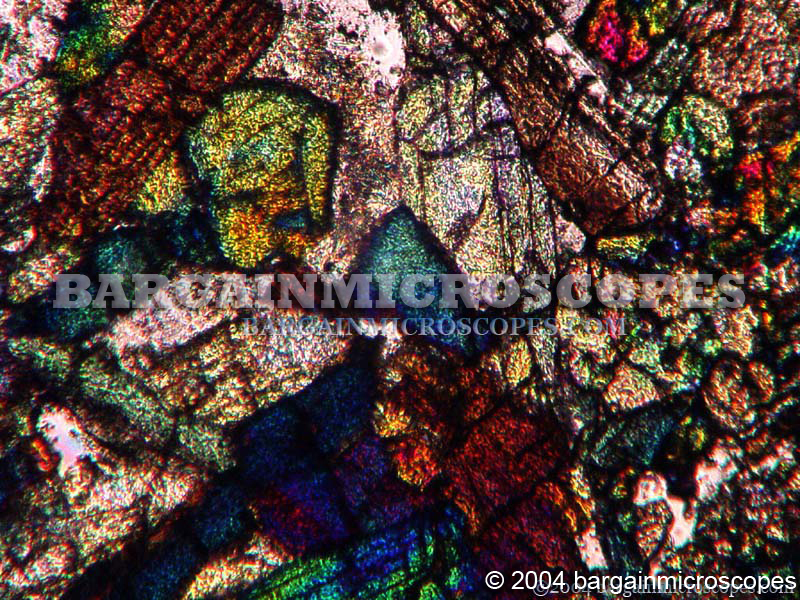 With the dual benefit of having Transmitted Polarizing and Reflected Polarizing Light, these Microscopes are an Unbeatable Choice for Petrographic, Mineralographic, and Geological Applications! 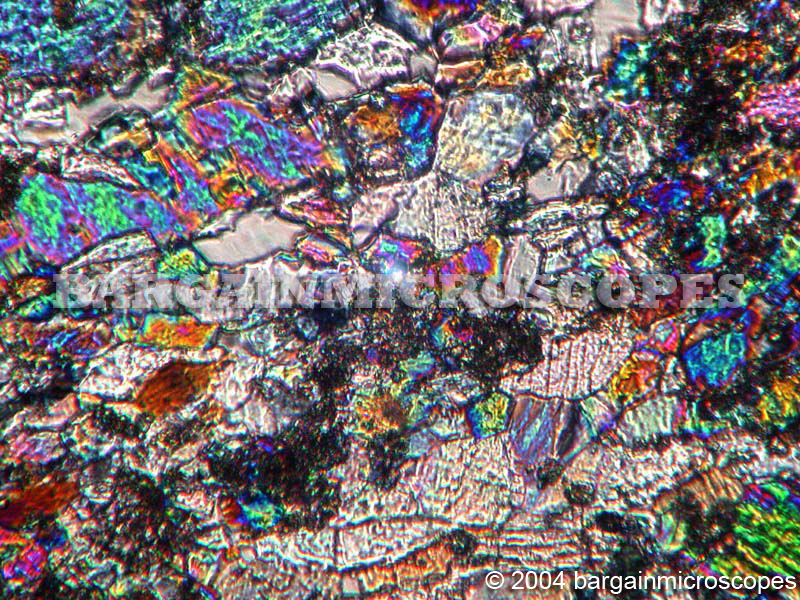 Great for Microscopic Examination of Opaque minerals in Reflected Polarized Light. CCD live video camera and cctv monitor is NOT included. 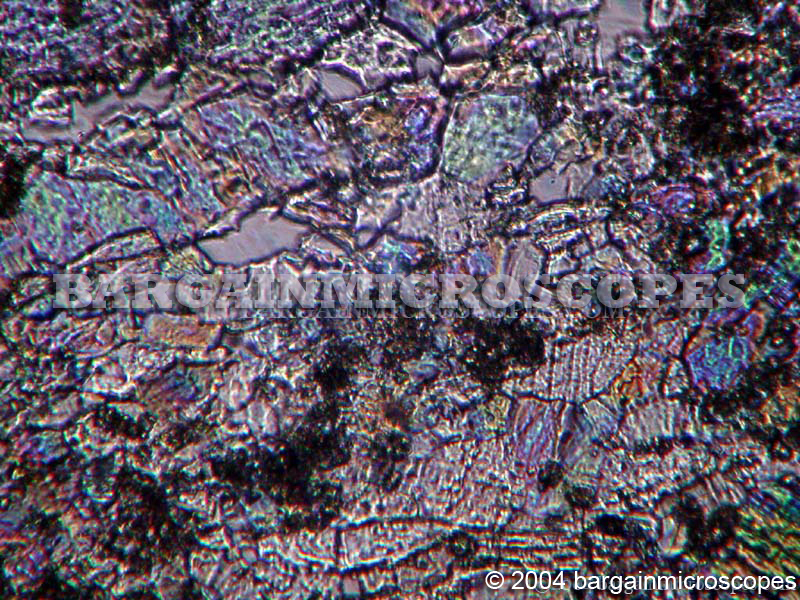 High Quality Professional Ore Polarizing Trinocular Microscope! Includes Capability for Both Transmitted Brightfield and Reflected Brightfield (like a Metallurgical Scope)! Great for Geology, Petrology, Mineralogy, and More! Compare to Similar Units costing $4000+ with name brands! Excellent Bright and Clear Images through High Quality Optics. 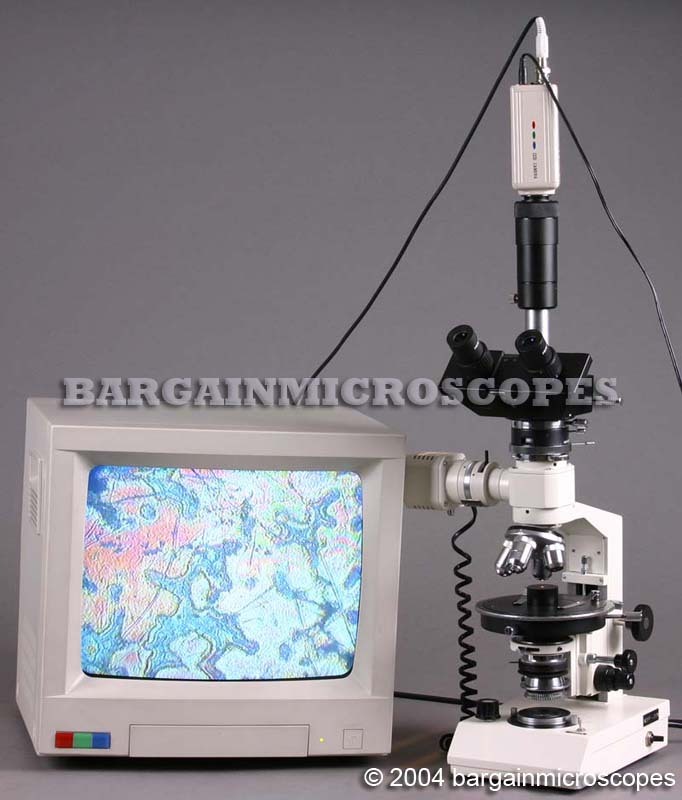 Polarizing microscope with Bertrand lens for viewing rock and mineral specimens. Does not include the USB camera or laptop that is shown. Camera and monitor are shown only for demonstration purposes. They are NOT included. Built-In Analyzer. Rotatable 90 Degrees with Graduation Marks every 1 Degree for the full 90 degrees. Transmitted Light Polarizer. Fully Rotatable 360 Degrees with Graduation Marks every 5 Degrees for the full 360 degrees. Selectable between Brightfield and Polarizing Light. Includes Built-In Photography – Video Port! Take Photos of Your Specimens! Attach a Digital Camera for Stunning High Resolution Digital Stills! For Details on Connectivity and required items, please contact us. Eight Magnifications: 40x, 60x, 100x, 150x, 200x, 300x, 400x, and 600x. Two Eyepiece Sets Included: Wide Field 10x and 15x. Four Semi-Plan Strain-Free Objectives: 4x, 10x, 20x, 40x. These Semi-Plan objectives are better quality and more expensive than the cheaper achromatic on most scopes. Spring Loaded 20x and 40x Objectives for Protection. Reflected Light: Variable Intensity 20W Tungsten Halogen Epi-Illumination. Transmitted Light: Variable Intensity 6V/20W Tungsten Halogen Base Illumination with Centering Adjustment. 1.25 N.A. Abbe Substage Condenser, Condenser Movement Knob, and Iris Diaphragm. Large Fully Rotatable Stage with Ball Bearing Movement, 140mm Diameter with Graduation Marks every 1 Degree for the Full 360 degrees. Stage Centering Knobs. Warning, not all polarizing scopes have the ability to center the stage with the objectives. If not properly centered, you will get eccentric viewing when rotating a specimen. Maximum Distance From Bottom of Longest Objective to Top of Stage: 18mm. Adjustable Screw-Stop to Limit Coarse Range to Protect Specimens. Total Overall Height of Microscope: 485mm. Mica (One Quarter Wavelength) Retarding Compensator Plate. Gypsum (One Full Wavelength) Retarding Compensator Plate. Includes: Extra 10x Eyepiece with Built-in Measuring Reticle: X-Scale, 10mm in 100 divisions, 0.1mm Resolution. Comes with Instruction Manual, Dust Cover and Lens Cleaning Cloth.